Popet® eWorksheets focus on Higher Order Thinking skills. Our eWorksheets encourage children to move beyond the knowledge and comprehension levels of thinking, and use more complex thinking levels such as analysis, application, synthesis and evaluation. identify animals usually kept as pets. draw a pet that they have or would like to have. 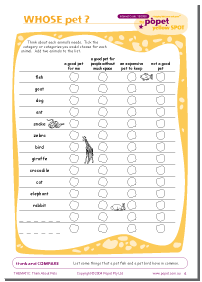 The typical worksheet involves some exercise in reading animal names but does not provide much exercise in thinking about pets. This worksheet does not encourage the child to move beyond what he or she already knows about pets. The task has a predictable response, requiring factual recall. consider the needs of each animal. tick the category that each animal could belong in. 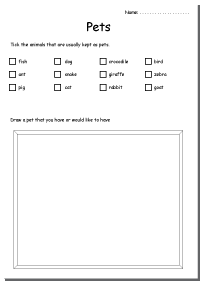 The Popet® eWorksheet involves some exercise in reading animal names whilst engaging the child in thinking about pets. By providing four categories that each animal could possibly fit into, the child is encouraged to apply and evaluate knowledge about pets. The categories are used as a vehicle to prompt diverse thinking rather than a common view. Thinking comes naturally to children . . .
Popet® eWorksheets nurture good thinking. Click an age button to pick a Popet® Spot . . . These terms and conditions apply to purchases made on this website from Popet Pty Ltd, ABN 71 106 087 889. All orders placed through this website are subject to confirmation and acceptance by Popet Pty Ltd. Popet Pty Ltd or its agent will provide products or access to the products you order as per the details you provide in your order. For each online order, you must pay the applicable price (as indicated in Australian dollars [A$]) for the relevant goods confirmed by Popet Pty Ltd and specified on the website at that time. Payment must be cleared before the products are dispatched or made available to you. All credit card information provided to the eWay and PayPal gateways is encoded using Secure Sockets Layer (SSL) technology, an encryption protocol that protects data as it travels over the Internet. By selecting a Tax Region outside of Australia on the Checkout form, you are declaring that you are not in Australia at this time and you will not be making use of this purchase in Australia. Any liability of Popet Pty Ltd in connection with products or services supplied to you will, subject to any non-excludable liability for breach of conditions or warranties implied by legislation and to the maximum extent permitted by law, at the election of Popet Pty Ltd be limited to: in relation to the products or service, the replacement of the products or service or the supply of equivalent product or service. Each order is governed by the terms and conditions current when the order is placed. Popet Pty Ltd may add to, delete or otherwise change these terms and conditions without notice. It is your responsibility to read and understand these terms and conditions each time you place an order. Prices and availability are subject to change without notice. Typographical, product description, pricing, images and other errors are subject to correction, even after orders and/or payment are accepted. All purchases under this website and these terms and conditions are subject to the laws of New South Wales, Australia. We are so confident that our eBooks will help your child learn and grow that we provide a “try before you buy” sample of each product. Please take the time to review and try the samples because we do not normally give refunds if you simply change your mind or make a wrong decision. This Refunds Policy forms part of, and is to be read in conjunction with, the Popet Pty Ltd Terms and Conditions of Purchase. Nothing in this Refunds Policy excludes, or purports to exclude, any warranties or conditions expressed or implied by the Trade Practices Act 1974 (Commonwealth) or any other applicable legislation, that cannot be (or have not been) excluded by agreement. This Refunds Policy must be read subject to such warranties and conditions, and all references in this Refunds Policy to “statute” refer to statutory provisions that cannot be (or have not been) excluded by agreement. For your security, all refunds will be made either by cheque, or by applying a credit against the credit card used for the original purchase. The actual method of refund will depend upon the payment method used for the original purchase. In some circumstances, we may elect that a replacement product or service is sufficient remedy instead of a full refund. This election will be at our sole discretion, but will only occur after consultation with you and in accordance with relevant warranties, other contracts and statutes. If we elect to have a product or service substituted, we will do this at our cost and send the product or provide access to the product (or its substitute) to you promptly. Please note that events such as wilful damage, misuse or unauthorised tampering with a product or service may prevent a product or service being accepted for refund. Popet Pty Ltd agreeing to the refund or exchange of a product or service is conditional on your acceptance to destroy any copy or copies you may have made (electronic or otherwise) of any copyrighted material that was provided to you, or you were given access to. In the event that you receive a product or access to a product that appears to have been corrupted during download from Popet Pty Ltd to you, you should notify our Customer Service staff immediately by email at customer.care@popet.com.au. In the event that you receive a product or access to a product that is different to the one ordered, you should notify our Customer Service staff immediately by email at customer.care@popet.com.au. If you still have questions after reading our Refund Policy, please do not hesitate to contact us by e-mail at customer.care@popet.com.au. Popet Pty Ltd may, at its sole option, revise any part of this Refund Policy from time to time without notice. The eBook you have selected has not been paid for, please make payment via Phone, Fax or Mail Order. The eWorkbook you have selected is currently being created. Please check back soon. The eWorkbook you have selected is not available in your default script style. The Username you have selected is already in use, please try another. Popet Education has produced multiple script versions for three of its most popular eWorkbooks that help children build their handwriting skills. In Australian state schools, there are five different handwriting scripts taught to young learners in the eight states and territories. This eWorbook has been created in versions for students attending New South Wales, Victorian, Queensland, Western Australian, Northern Territory and Australian Capital Territory schools. A Plain Handwriting Script has recently been introduced which has proven very popular with customers outside of Australia as well as with parents and carers who are Home Schooling.